The many faces of Michael Jackson. 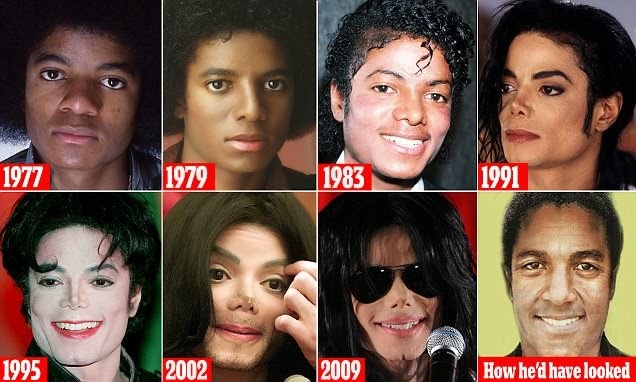 A new TV documentary about his surgery addiction has revealed how Micheal Jackson used sister Latoya Jackson as a plastic surgery Guinea pig.It also reveals how Michael would have looked like without the surgeries .The documentary titled The 10 Faces Of Michael Jackson showed a computer generated image of how the legend would have looked at 55. Once satisfied with the results of La Toya’s operation, Michael went ahead with it himself in 1979. Body dysmorphic disorder expert Dr Eda Gorbis who believes Jackson was suffering from the illness, where sufferers have a distorted view of their appearance has claimed he had as many as 100 procedures.